oh this is so priceless!!!! What a charmer that little fellow is! I love the stretching picture. And what good taste he has! Beautiful scene, Merisi. It underlines the need all creatures have for sweet things. WHat a wonderful bird! Such personality! Such boldness! Such charm! Makes me want to paint him. Aha - you paid the bird for this photo shooting! A lovely example of a young female just completing her moult. She is probably feeling a bit itchy! A lovely capture of bird behaviour! What a wonderful series of photos. 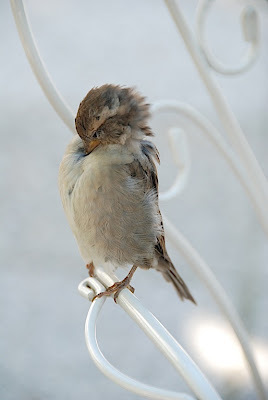 I love that little sparrow. 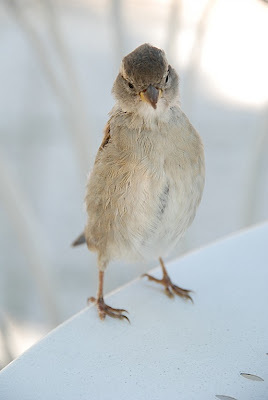 She is standing up so tall and straight (for a sparrow)! Great photos, Merisi. Thank you so much for these photos - they made my day. Sparrows are my FAVOURITE bird. I really need a new photo for my blog. Would you mind if I used one of them and credited you? 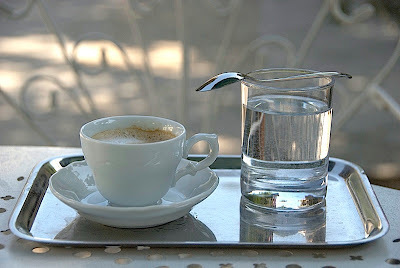 a sparrow... sharing your tea. lovely! I ask you, if there were beings as large as you are compared to the sparrow and they set down a piece of their pie, would you have the courage to hop up on the meringue and have a bite? 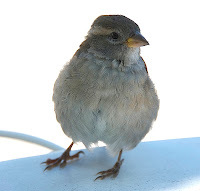 It did take a lot of courage for this little sparrow to sample your pie. It must have been very hungry indeed. Your photography is first class work. thinking who knows how long that gorgeous late summer weather is going to last! Yes, one has to admire the courage (and the pluck!) of this little youngster! I left the possibility to enlarge the images. A professional photographer told me that his pictures are being stolen all the time, but he doesn't fret about it. Kind people will ask, others will steal anywhy - so there, glad you noticed and enjoyed the larger versions! She exhibited really intersting behavior. What a sweet little bird! You captured such personality in this little winged friend. What precious pictures, Merisi! I know your heart was singing as you took them. Charming Merisi. 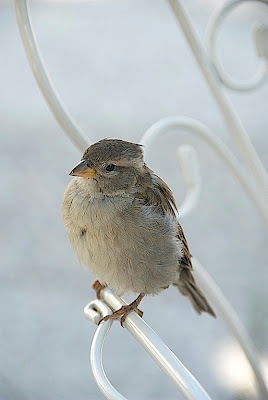 I love the stretching sparrow and they are fabulous enlarged. 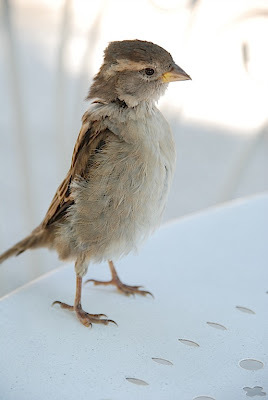 you have a way of making this little inconsipiuous brown sparrow, a rare exotic bird - good photography, Merisi! Oh, what very sweet pictures! You must have been very still and patient to get those! Well done! Smart sparrow. I would go for the lemon meringue also.